info about electronics which you can find here and there is of course a lot more in depth information available online. feel free to add, correct, ask or comment in any other way. When you want to connect a single output of a logic chip directly to an input you generally don't need any extra components. be connected to any digital signal which in some case might be easier when designing a PCB. unpredictable signals. Be careful though, inputs are sensitive to static electricity so they could get damaged. between a pullup or puldown resistor depends on the circuit. 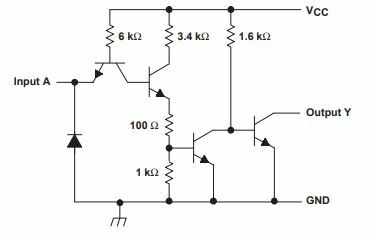 comparator or even another logic gate could be used. As with the diode OR/AND gates you could use an actual inverting logic gate but sometimes a single transistor can be a lot more convenient. plenty and with a pullup resistor connected to 12V the output can now switch between GND and 12V with a much lower control voltage. unstable supply voltage on purpose. I'd like to add my 2 cents on outputs. As Phobos pointed out there are more than one type of outputs but one type of output has not been discussed so far, there is what is called a totempole output or push-pull output where the output can sink and source current (usually the sink capacity is more than the maximum source current, but there is also an open collector output, which can only sink current, it is nothing more as a dedicated transistor where the collector is connected to the output of the chip. So in order to use this output you have to provide a resistance to VCC in order to have some current to sink. What are the common uses for an open collector output? Well first you can use it to as Phobos called Mickey Mouse Logic where one resistor is connected to VCC and the other end to a multiple of outputs (logic AND), secondly you can use (some, not all open collector outputs) it as a level shifter, where the chip is powered from VCC and the resistor from the open collector could be tied to the + 15 volt. Thanks, it reminded me to add some examples which I just did. and the low states through the diodes.